After we cut the t-tape to the length of our rows then we will fit seeper-ends on the t-tape. Taking the roll of tubing he will cut several 6 inch pieces to be used in the end of each row. The seeper-end is a 1/4 inch fitting also. He has to push hard to get the tip into the hose and so uses an extra glove for padding. In the past we have used spaghetti tubing, which is a black softer hose in place of the white tubing. It is smaller and you would need to buy a smaller tip to go on the end. We have had a harder time finding these in large quantities and so have switched to the larger size. Taking the tip in his hand he pushes it into one end of the small tube. Then he is ready to push the bare end into the top of the t-tape. These rows were laid without the ends on the t-tape. We were waiting for the 1/4 inch hose for the fittings. First he folds the end of the t-tape in two places, making a backwards fold. 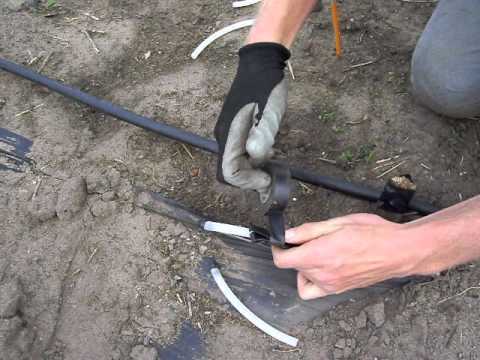 Then very carefully he pokes a hole beside the drip line on top of the t-tape; stretching it a little to allow the insertion of the 1/4 inch hose. We usually use a pencil for this as it has a nice point and the angle widens to make the right size hole. If you use a knife be very careful not to slice a hole through to the other side of the t-tape. Insert the tube into the hole, fold the t-tape and wrap black electricians tape around several times to secure the t-tape and prevent any water leaks. Insert the seeper tip into your 1/2 inch mainline and wiggle a little to seal the hole from leaking. We have a stake at the top of each row to prevent the mainline from moving when straightening out the t-tape rows. These can be done ahead of time, even in the winter if you have room to store them. I will add a video so that you can see how quickly the ends are fitted into the t-tape.